Mitigating climate change impacts, and protecting and preserving waterways and lands are central to First Nations values across Canada. Yet many First Nations lack the infrastructure to practice and implement those values. To enhance quality of life for residents in Northern Ontario, with the assistance of Indigenous Services Canada, Nishnawbe Aski Nation (NAN) and Recycling Council of Ontario (RCO) have partnered to advance circular economic and waste reduction programs in 49 First Nations. Respect and encompass First Nations’ values. 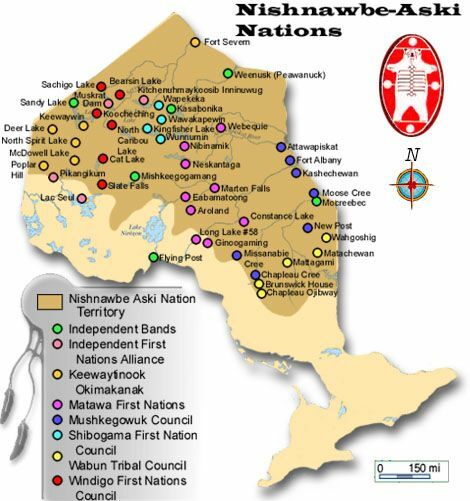 Develop co-operatively with all First Nations that comprise NAN. Establish opportunities to develop partnerships (on and off reserve) that offer viable, productive, and long-term solutions. Consider long-term impacts and ensure sustainable outcomes. Prioritize protection of lands and environment. Identify, align, and leverage related work (e.g., climate change mitigation and food security). Provide opportunities that foster local jobs, training, community engagement, and capacity building. Contribute to economic and social gains. Reduce environmental impacts – water protection, pollution prevention, resource recovery, and greenhouse gas emission reductions – by improving the management of waste. Reduce financial costs and associated risks by transitioning to more sustainable waste management practices that includes implementation of reduction, recycling, and composting programs. Transition economic activities from linear to circular modeling through education and implementation of green procurement models. Provide economic growth through the creation of sustainable green jobs through improved waste management infrastructure and operations, as well as the implementation of diversion (recycling and composting) programs. Improve community pride and engagement through community-based and school education programs. The program will be developed within 18 months with full implementation phased in over multiple years. The project will be designed to address several issue areas that may require parallel implementation strategies. Implementation will be managed in three distinct phases to allow for proof of concept and opportunity for partners and community consultation and engagement. The strategy will set out implementation plans for each of the critical action areas, with details regarding budgets, human resources, roles and responsibilities, timelines, and reporting. The strategy will also provide project plans for each of the key areas to guide implementation and reporting structures. Each area will identify partners and community engagement strategies. It will indicate what resources and expertise are available within NAN communities, and what assistance may be needed from other sources. In that regard, the strategy could identify and look to leverage successes in other municipalities or private sector experts. The strategy may also include reporting structures that provide resources to other First Nations to share knowledge and experience. The implementation phase will deliver on sub-plan for each of the critical action areas, and will include specific objectives and management plans for with clearly defined deliverables and completion dates. Implementation may have overlapping projects and varying timeframes. Each sub-plan will have individual reporting structures. Support for building circular economies in First Nation in Northern Ontario has been provided by the First Nations Waste Management Initiative (FNWMI) through Indigenous Services Canada (formerly Indigenous and Northern Affairs Canada).